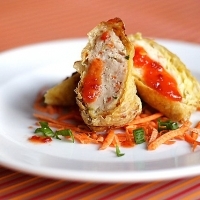 Meat and vegetables wrapped with bean curd and deep fried to perfection is a mouth watering appetizer. 1. Mince the chicken and pork meat with a mini food processor or with hand. 2. Add shredded carrot, chopped scallion, and all the seasoning into the minced meat and stir-well. Set aside. 3. On a dry surface, lay out the bean curd skin. Use a damp cloth to moisten the skin. 4. Place 2 – 2.5 tablespoons of minced meat onto the lower center of the bean curd skin. Leave about 1/2 inch on both sides. 5. Fold the sides inwards and roll it up. Use some water or the minced meat to seal. 6. In a deep fryer or frying wok, add enough cooking oil for frying purposes. 7. Once the oil is heated, add in the meat rolls and deep fry to golden brown. 8. Dish out and serve immediately with chili garlic sauce or sweet chili sauce. Thank-you for this very unique sounding first recipe. I hope your enjoy your stay here,there are many nice recipes and even nicer people. Like ysabelaline's recipes? Never miss an upload!